Here is a great drill that allows you to add some variety to a traditional triangle training drill. 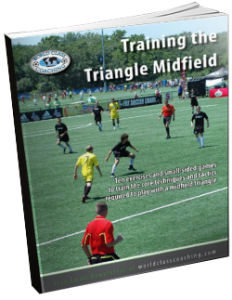 In the video below Tom Mura, from World Class Coaching, animates a Two Triangle drill that you can easily adapt to your own needs.The drill allows you to emphasize/ train a wide variety of fundamentals depending on the skill level of your team. World Class Coaching offers a number of great resources for soccer coaches, if you haven’e already, check them out HERE. The YouTube video below has audio, so please make sure that your speakers are turned on and that you have access to the site. Note that some schools still block access to YouTube.